Many of us have problems remembering people’s names, even when we know their faces very well. Birthdays and anniversaries forgotten are often a major source of embarrassment, and how frequently do we not get all the items on our shopping list? When giving a presentation without notes, unless learnt by rote, there is always the risk of missing out something important. However it doesn’t have to be that way. There are techniques and methods to help improve memory, and below are three of the best. This is surprisingly simple, is great for lists and is based upon associating the items you want to remember with the visualised memory ‘pegs’ you already have for the numbers on the list. For example in a shopping list the first item on your list i.e. number one is peas, two is carrots, three is eggs, four sausages etc. There are two principal ways for creating the ‘pegs’ for the numbers, the first is to use rhymes for the numbers, the second to have a visual image for each number. Once you have visualised each of those rhymes against the number i.e. created your peg, you can associate items in your list. So returning to our shopping list; for one you would visualise the gun firing peas. For two the shoe could be full of carrots, for three the tree could have eggs hanging from it, and four the door has a sausage for a handle etc. The second approach is to visualise based upon the shape of the number itself. So one could be a straight pencil, two a swan with its curved neck, three could be the image of a person’s bottom, four an upside down chair with it legs point skyward etc. Again, once you have these pegs, you can attach the items through visualisation. Using the same list; one could be the peas skewered on a pencil, two a swan eating a carrot, three a bottom squashing the eggs, four the sausages skewered on each of the upturned legs of the chair. Whether based upon the number’s rhyme or the shape of the number, the images need to be strong and the more outlandish the better. You can even add in more imagined detail such as the feeling of squashed and broken eggs, or the smell of cooking sausages. The important point is once you have your pegs, you can use them for lists of names, faces, dates or even the sections of a speech. But because it is the pegs that are the constant, it will only be the most recent list that will be easy to remember. Previous lists will be harder, and it does require practice and to learn the pegs by rote. This is again a visualisation tool and is great for lists and remembering the order of a speech or presentation. It requires you to visually link items you wish to remember to locations you know very well, and again there are two approaches. It could either be associating items with objects in the various rooms of your house, or to the familiar landmarks on your regular walking route to the park etc. In both approaches the important thing is always to visualise the same route navigating either room to room around the house, or the walking to the park. As with the pegword technique once you have your visualised route, and the respective objects and landmarks, it is easy to associate the items you wish to remember with them. For both you put the items you wish to remember into pairs, and then visualise them with the object or landmark. Returning to our shopping list, in the house method, the peas and carrots could be boiling in your bath, the eggs and sausages could be frying on the bed etc. On the journey method the peas and carrots could be falling out, orange and green, from the opening of a letterbox, with the eggs and sausages hanging, freshly cooked from the next lamppost. Notice I have embellished the visualisations with cooking and colours to heighten the memory. The great thing about this method is you only have to remember where to start and the walk takes you past all the items you need to buy. The downside is unlike the pegword system where you can go straight to say item three, loci requires the items to recalled in the order in which they appear on your walking route. Also like the pegword method the list of items gets ‘overwritten’ each time used. Both the Peg and Loci methods use the visualisation of associations to aid the memories, the story or link method is a verbal equivalent where the items to be remembered are built into a narrative. Returning to our little shopping list, the story could be ‘There were two chickens. One chicken started eating a large pile of PEAS whilst the second ate a big bunch of CARROTS. When they had finished they both laid huge EGGS, which when they hatched revealing frying SAUSAGES.’ Like loci this also requires the items to be remembered in the order in which they appear in the story, but is ideal for supporting something ordered such as presentation. The speaker uses the story as the prompt for the various sections of their speech. The story does have to be outlandish to be memorable and again is ideally embellished such as the ‘frying sausages’. Each of the three techniques described is easily learnt, but requires practice and none can work well with information that is being received very rapidly. 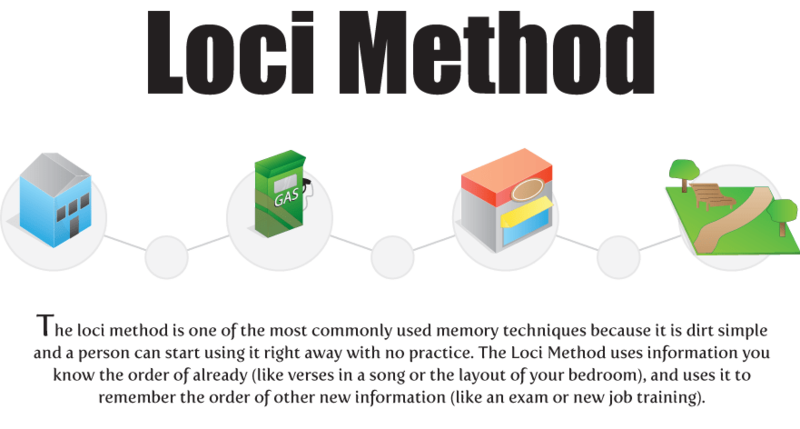 Both loci and pegword are useful for short term memories and lists, but the story method can be used to retain memories for a much longer period. All three are based upon establishing multiple pathways for the memory in the brain. So in peg there is rhyme and visualisation, in loci there is visualisation and the memory of walking, and in the story method, links made between the items support the retention of the items themselves.